​The bitter with the sweet, the rain after the sunshine. Earnest Brisbane trio Columbus know what it is to love just as they know what it is to lose, and they lay themselves bare for the world to see on their charmingly evocative debut album, Spring Forever, set for release on Friday 26th August. And as the days get warmer and the Daffodils start to bloom, Columbus will take Spring Forever on tour in October. Spring Forever will be heralded in by Raindrop, a song about love, relationships and how a single event can tear it all down, leaving nothing but fond memories, regrets and the realisation that nothing lasts forever. “It’s an album about love, getting older and coming to terms with losing someone at a time when you’re still learning things about yourself,” says guitarist & vocalist Alex Moses. “As I was writing the album, the references to seasons came very naturally - I sometimes feel like I have to fight through the cold, the winter and the hard times to get to the Spring. Columbus’ roots were laid in high school, when Moses would go round to drummer Daniel Seymour’s parents’ house and jam punk rock covers before they got home from work. They knew bassist & vocalist Ben Paynter from the school jazz band they were all in, and when he completed the line-up Columbus was solidified. The band released debut EP Sad Songs And Sing-Alongs in 2013, followed by the breakthrough EP Home Remedy two years later. This led to international attention, culminating in press and radio attention from around the world and the band winning Best Newcomer and Best EP at the Blunt Magazine 2015 Readers’ Poll. 2016 opened with a performance on Unify’s mainstage which was soon followed by the band signing to UNFD and starting work on what would become their debut album. 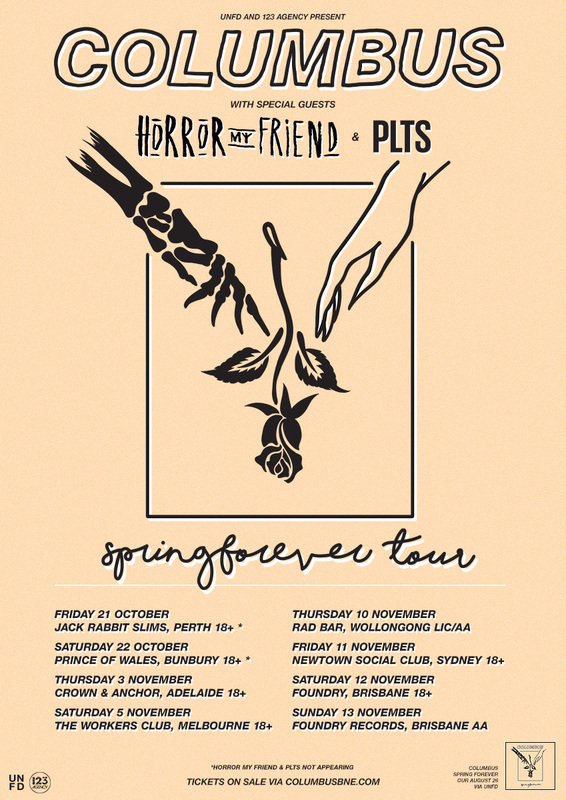 Taking its cues from other classic power-punk trios’ albums, Spring Forever has a gorgeous simplicity to its melodies that hints at the darkness that is never far away. Produced by former Defeater sonic architect Jay Maas (Title Fight, State Champs, Polar Bear Club), it’s a mature, heartfelt collection of anthems-in-waiting. If there’s a hidden theme to Spring Forever it’s of wisdom reluctantly gained through those little trials that grow into battles within our heads. All the songs on the album were born in the guitarist’s bedroom, plucked gently into life on his battered acoustic and blossomed into gloriously raucous punk rock thunderclaps thanks to the noise and shade provided by the rest of the band, even though they all retain a sweetly painful honesty. If the songs grew from a place of sadness, they blossom into the world with a small smile that says it’s all been worth it. 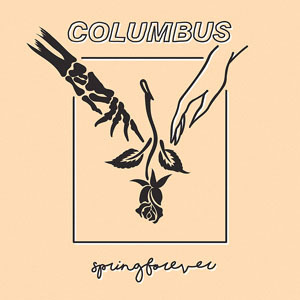 Columbus Spring Forever is out Friday 26th August and is available for pre-order from 24Hundred and iTunes.